May's update includes an amazing coincidence. Our April update displayed a picture entitled 'Christ Head'; in our conversations with Otto Chlup about the picture, Otto mentioned that there was a companion piece that went with the picture, this companion piece is known as 'The Praying Hands'. Unfortunately we didn't have a copy of 'The Praying Hands' in our archives. But, would you believe, within a day or two of the Christ Head being published, a copy of 'The Praying Hands' came into our offices courtesy of Mr and Mrs Latour. This is a remarkable find that we are now pleased to bring you. 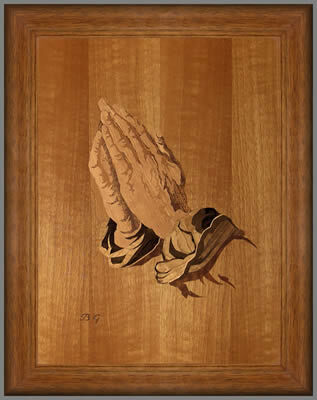 The Praying Hands wood inlay picture by Buchschmid and Gretaux is a variation of the famous picture by Albrecht Dhurer (sometimes spelt as Albrecht Duerer) depicting the hands of a Monk in prayer. This wonderful picture resides in the USA and is owned by Mr & Mrs Latour. It provides constant joy and inspiration to the congregation when it is displayed at important festivals by Mr & Mrs Latour at their favourite Church. We think you will agree that this is a wonderfully made wood inlay picture; the veneer selection is superbly judged with delicate shading between the fingers of the hands. Quite often the division between the fingers can very easily get over done and produce a kind of cartoonish style. But with this picture, the separation of the digits is done with a subtlety and appreciation of the medium that is a true joy to behold. This is definitely one of those understated masterpieces that Messrs Buchschmid and Gretaux were so famed for with their wood inlay art work. The item that previously occupied this column has now been withdrawn. The disclaimer in the middle or centre column refered to the withdrawn item. It is in no way connected with the Wood Inlay picture featured at the top of this page. Click the above button to return to page 19 of "Can You Help"
Click the above button to visit page 21 of "Can You Help"